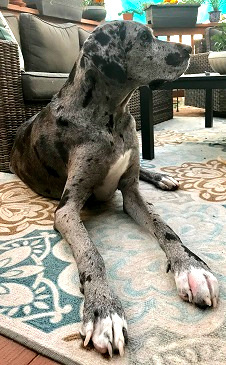 Teagan - Rocky Mountain Great Dane Rescue, Inc.
Hi, I’m Teagan! 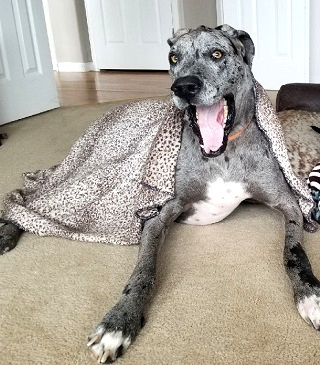 I’m a 4 ½ year old merle male Dane with natural ears. My family has to move overseas, so I’m looking for a new awesome family to call my own! 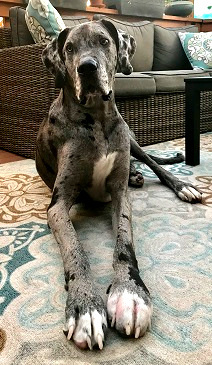 I’m good with other dogs and have been living with another Dane. I haven’t spent any time around cats or kiddos, so I would need a little time to figure them out. I know all of my basic commands and am housebroken. I’m also trustworthy with free roam. I haven’t spent any time in a crate, but I absolutely love doggie daycare. 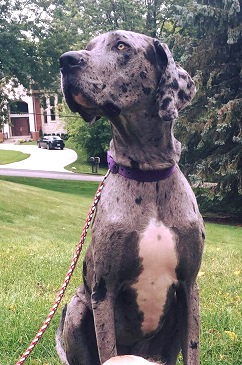 I also love going for walks and am great on a leash with a gentle leader. Oh, and one more fun thing – I LOVE tomatoes! Like more than anything! I think that’s most of the big things, but why don’t we get together to see if we could be the ultimate family?